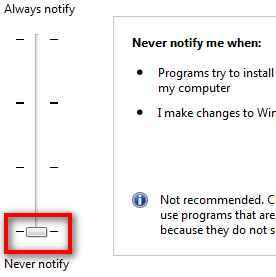 4 easy steps on how you can turn off UAC in Windows 7. 1. Goto control panel and make sure you’re viewing by category. Select System and Security. 2. Under Action Center, select Change User Account Control settings. 3. Drag the vertical scrollbar down to the lowest level (Never Notify) and press OK.
That’s it! That way you won’t get that bugging “are you sure you want to…” message in Windows 7 again.